Good Thursday all or as I like to call it Friday eve . Today we are going to review the third book in The eternity series . I MARY by Mike Hartner . A girl with something to prove. A ship with endless challenges. Will a life on the water set her free? Mary Crofter has spent her life around ships. She’s in love with the sea in an era that keeps girls far away from the deck. Breaking social norms, she joins the crew of a small ship and sets sail for a new life. Eager to prove her mettle to the all-male crew, Mary demands she be treated no differently. She works hard in a world that finds an English civil war brewing and spies around every turn. When she meets a man who offers her a much safer life on dry land, she must choose between the promise of love and the call of the sea. 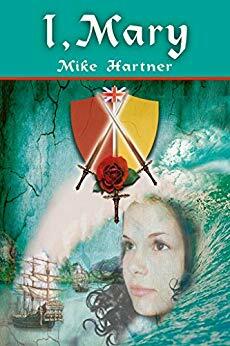 I, Mary is the third installment of the Eternity Series, a saga of seafaring adventures for both teens and adults. If you like strong female characters, immersive historical fiction, and sweet romance, then you’ll love Mike Hartner’s adventurous tale of the sea. Buy I, Mary today to set sail for an adventure of a lifetime! Mary Crofter has been on a sailing ship since she was two years old . As part of the Crofter shipping line she know all there is to know about the sea and the ships that sail her. She showed her merit by working along side the men crews and earned their respect and admiration. Until the day that Andrew walked into her life Andrew the young idealistic man that will help shape the English war that was brewing . Now will she give up her love of the sea for the love of her life .